Rosie is a Connemara/TB cross who is the first offspring of Blue Ridge Monroe. She turned 4 years old in Oct. of 2014 and currently is a 15.2 ish. She fairly big bodied and has no problem carrying a 5’6″ young man. Rosie came to Stone Gate Farm in the spring of ’13 as a completely unhandled 2 1/2 year old. It didn’t take long for her to want to be in your pocket and be the center of attention. We can’t say enough about this very special little horse. It wasn’t until the spring of ’14 that she began her training with a lot of long reining and ground driving. When it came time to start her under saddle it was a breeze. By her 3rd ride she she went for a trail ride and led the entire ride, her 4th ride she was trail riding by herself, her 5th ride she was going through the water jump and up and down the bank. Her 6th ride she to did the entire Intro cross country course and a few starter jumps. She was ridden during the madness of the Mini Trials schooling day and she been on a rode trip for the sole purpose of hanging out in the trailer while the horse she came with was ridden! This is a level headed horse who truly wants to please and is going to develop into one of those horses that either is handed down from one sibling to another or becomes a ‘forever’ horse for a lucky junior or adult amateur! She definitely is a barn favorite and one of Kyle’s favorite rides! 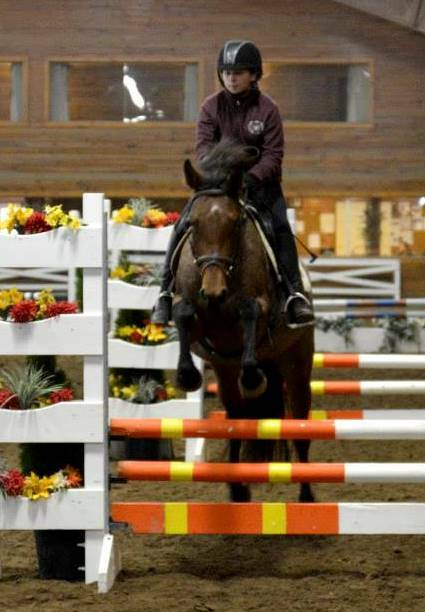 Nov 12 Update: Rosie went to her first indoor jumper show at Chagrin Valley Farms last Sun and she continues to impress. Although she was a little anxious by the environment aka a crowded warm up; she performed great. She never got in the main ring, which can be a little spooky with the one wall being the glass lounge, before competing but she took it all in stride. What was even more impressive is that she was being shown by a 12 year old student of Kyle’s who hadn’t jumped her before Sun!! 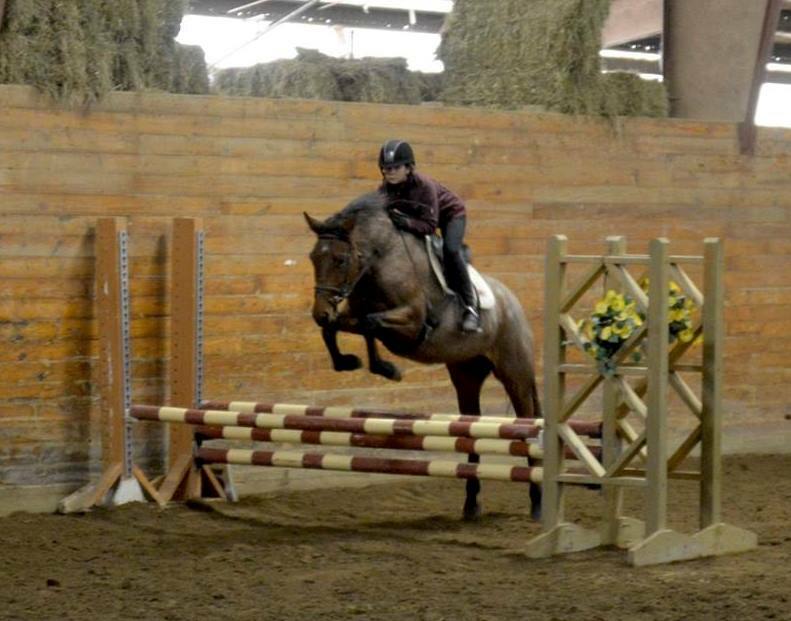 They did 2 classes at 2’6″ and finished the day with NO jumping penalties! Aug 3rd Update: Rosie competed in her very first competition only 8 weeks after her first ride. She was very professional and ended up winning her 2′ division! !